Allyson Wong proudly conquers her opponent while wearing a blue MSJE team shirt. 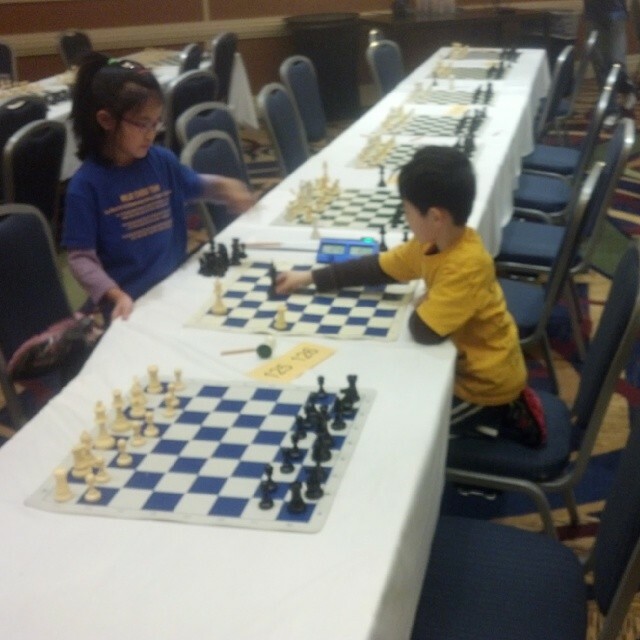 On January 11-12, several hundred of the most talented young chess players in Norther California attended the Calchess Grade Level State Championship at the SFO Airport Hyatt Regency. Students from the Torres Chess and Music Academy‘s school program at Mission San Jose Elementary School once again dominated every grade they fielded a team in. The only disappointment for head coach Joe Lonsadale was the fact that MSJE sixth graders had another commitment which made it impossible for Mission San Jose Elementary School to have a clean sweep of all the elementary grade levels. Still, it’s hard to be too disappointed when your team wins first place in kindergarten, first grade, second grade, third grade, fourth grade, and fifth grade! Mission San Jose Elementary School also had had individual first places in grade 5 (David Pan), grade 2 (Kevin Pan), and grade 1 (Arnav Lingannagari.) All the credit that does not go to the players themselves must be given to head coach Joe Lonsdale, who despite being obviously under the weather, analyzed his kids games for two straight days. WALNUT CREEK, CA, May 6-8, 2011: Walnut Creek seven year old Ben Rood was awarded the title of K-1 National Chess Champion at the 2011 United States Chess Federation National Elementary Chess Championships held in Dallas, Texas on May 6-8. Ben’s presence attracted interest in the section for kindergarten to first graders because he had the highest chess rating of all 294 contestants. Despite the tough competition, Ben won all seven of his games against the very best chess players his age in the country. The most challenging game for Ben came in round 5 when he was paired against last year’s K-1 champion, Praveer Sharan. It took Ben Rood 3 hours and 81 moves to finally defeat Praveer. He then had to continue his perfect record for two more rounds in order to be crowned a National Chess Champion. Ben Rood’s path to becoming a National Chess Champion began at the age of three when he decided that 300 piece jigsaw puzzles were too easy and his mother decided to introduce him to the game of chess. 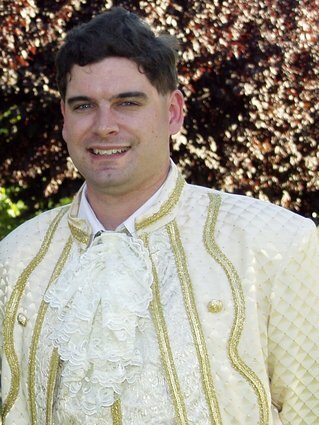 When he entered school, Ben started attending chess classes run by the Berkeley Chess School. For one so young, Ben’s desire to improve was immense. His parents began signing him up for tournaments very regularly and taking him to the Friday Night Chess program run by the Berkeley Chess School. In spite of winning first place in the Kindergarten section at the 2010 Calchess Scholastic State Championships, Ben had reached the point of needing personal attention to draw out his natural talent. During the summer of 2010 Ben met chess coach Chris Torres, president of the Torres Chess & Music Academy, at a chess tournament. The two started training together a short while later. Chris has taught several other national chess champions. He immediately recognized Ben Rood’s remarkable talent. Chris then devised a plan to get Ben calculating more accurately while playing more aggressive openings that would better suit his personality and amazing tactical vision. In December of 2010, Ben Rood traveled to Stockton for the Calchess Grade-level Chess Championships and used his newly found chess style very effectively. Ben won all his games easily and became the Grade One State Chess Champion. Over the next several months, Ben’s chess improved at a rate never before seen from a six year old chess player. By February of 2011, Ben was beating very strong chess players of all ages while taking care to record his games accurately for later review with his coach. In the first week of April, Ben Rood competed in the Calchess Scholastic State Championships K-3 division, held in Santa Clara. During this tournament, Ben once again achieved a perfect score and even defeated the reining second grade National Chess Champion, Josiah Stearman. For his remarkable performance, Ben Rood became a State Chess Champion for a third time. According to his coach Chris Torres, Ben Rood is the only first grader in California history to win the State Grade Level Chess Championship, the State K-3 Chess Championship and the National Chess Championship in the same school year. Chris attributes Ben’s successes to his remarkable talent, love for the game, incredible work ethic and to the support that his parents Robin Hultgren and Lisa Rood provide. Chris Torres had other Torres Chess & Music Academy students to make him proud in the K-1 section. Chris’ other students included Milind Maiti, from Cupertino, who placed third in the individual competition. Five members of the Mission San Jose Elementary School team, Rishith Susarla, Chenyi Zhao, Soorya Kuppam, Jeffrey Liu, and Amulya Harish also placed third in the school competition. The 2011 Fremont Summer Chess Camp at Mission San Jose Elementary School offers students from around the Bay Area an opportunity to train with the players and coaches of the Mission San Jose Elementary School chess team. Our chess team has had unrivaled success at State Championship events and in 2009 became the first California school to ever win the National Elementary Chess Championship. At the 2010 Calchess Grade Level Chess Championship the team from Mission San Jose Elementary School won first place in five out of the six grades that we were eligible to compete in. The Mission San Jose Elementary Chess Team also dominated at the 2011 Calchess Scholastic Chess Championships by placing first in two of the three sections we participated in. Make the right move by signing your child up for the 2011 Fremont Summer Chess Camp at Mission San Jose Elementary School. Don’t be fooled by imposters. There is only one summer chess camp managed by the chess coaches from Mission San Jose Elementary School. Visit ChessAndMusic.com to reserve a spot for your child. Ben Rood scored a perfect 6/6 in the k-3 championship section at the 2011 Calchess Scholastic State Championships. For many at the tournament, Ben’s remarkable performance was the most memorable aspect of the 2011 Calchess Scholastic State Championships. For his coach, the most memorable moment came after Ben’s fifth round win over Josiah Stearman (1712). Immediately following the game, Ben Rood ran up to his mother, Robin Hultgren, and took part in a hug that could have rivaled the joyous embraces that American sailors returning from the second World War shared with their wives. This is the third time that Ben Rood has earned the title of “State Champion” and he is only in the first grade! First Grader Ben Rood continues his impressive streak by defeating current grade three State Champion Joanna Liu (1540). Ben’s play at the 2011 Calchess Scholastic State Championship is entirely consistent with the brilliant chess I see from him every week during our lessons. Anthony Zhou, another one of my favorite students, is also 4/4. The two seemed destined to clash in the coming rounds. If this occurs, it will be the most difficult experience of the tournament for the players and their coach. 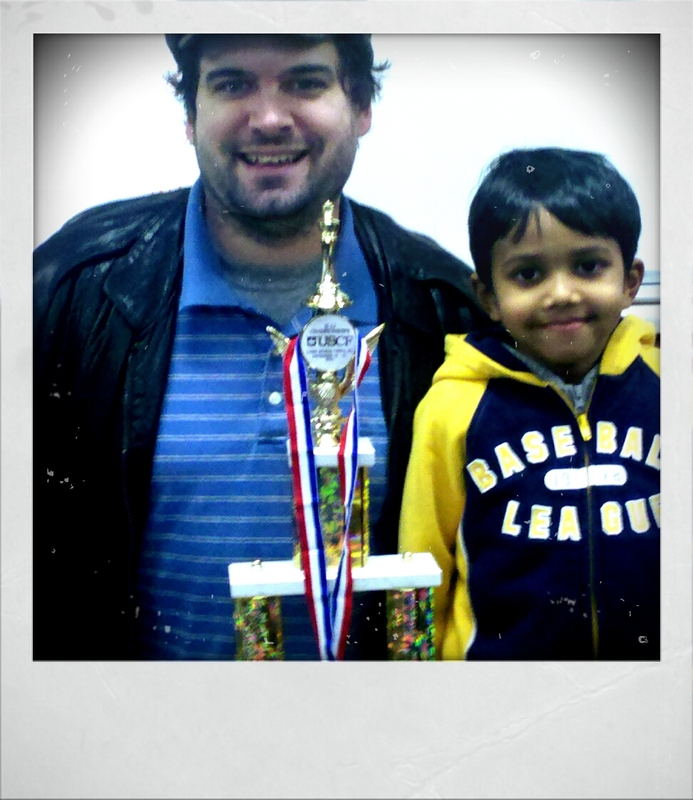 Milind Maiti with his chess coach, Chris Torres. 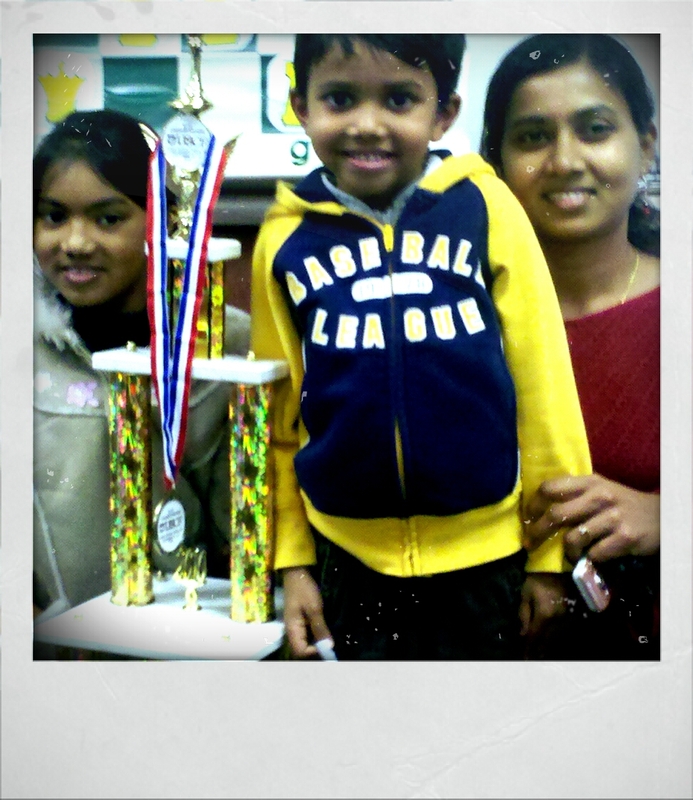 Milind Maiti with his Sister, Mother and trophy from the Nationals. Congratulations are in order for three Torres Chess and Music Academy students from Northern California who attended the 2010 USCF National K-12 Chess Championship in Florida from December 10-12. Milind Maiti, Chenyi Zhao and Ben Rood traveled across the country to this tournament less than one week after competing in the Calchess Grade Level Chess Championship in Stockton, California. All three of these amazing kids played admirably and finished the National K-12 Championship with more wins than losses. Milind Maiti tied for third in the Kindergarten section with a score of 5.5/7. Chenyi Zhao tied for 26th in the first grade section with a score of 4/7. Also in the first grade section, Ben Rood tied for 9th with a score of 5/7. Milind Maiti has a perfect record after two days of intense games at the 2010 United States Chess Federation National K-12 Championship. Thus far, Milind has defeated all challengers including the impressive Atreya Vaidya and Maggie Ni. Tomorrow morning, in round 6, Milind Maiti will face the only other undefeated kindergartener. Should Milind Maiti defeat Stephen Gerald Barrick, he will only need a draw in round seven to become a National Chess Champion. Milind Maiti is a kindergartener who attends Collins Elementary School in Cupertino, California. On Tuesdays, Milind Maiti attends the Collins Chess Club under the direction of Chris Torres. For more information on chess classes run by the Torres Chess and Music Academy please visit www.ChessAndMusic.com.